There are chocolate people; there are vanilla people. And then there’s me. I am firmly, proudly and happily a caramel person. There is nothing I adore more than a rich, buttery caramel. Oh my. As a kid, I was all about See’s Vanilla Caramels and always got a box on special occasions. No nuts, no chocolate, no marshmallow – just sweet, delicious caramel. I would save, hide and hoard that box to make them last as long as possible. When See’s changed the recipe and added nuts, it was over. I ended my long relationship with that little box. They just weren’t the same and I went without for a long while. It was a sad time. At some point, I realized I could just make them myself. That was a banner moment. A triumph, in fact. In the last few years, caramel with a bit of salt has become all the rage. I’ve never been happier. This combination of salty sweet took my favorite thing right over the top. While in Paris a few years ago, I dragged my friends across town to Pigalle, to the most fantastic chocolate shop with the most interesting of owners to get some of Henri Le Roux’s CBS Caramels (Caramel au Beurre Sel) and threw one of the Bernachon’s salted caramel bars into my bag as well. Both were a revelation and I made them last as long as possible. From that moment on, I added salt to every batch of caramel I made. My sauces, ice creams, tart fillings and individually wrapped pieces were so much better for it. I even make a wedding cake with a salted caramel filling that is really something else. 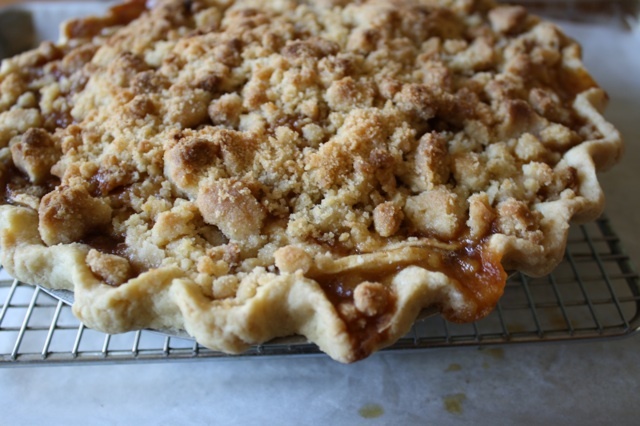 A few weeks ago, my friend Calvin (of the hilarious cobbler comment) said “Hey – can you make a salted caramel apple pie?” It was an interesting question. I hadn’t much thought about it before but it certainly sounded good. “Sure, when I get a chance”, I replied. I meant to make him one, really I did, except my to-do list has been so long, I’m tripping over it. I put the thought on the back burner and promptly forgot about it for a while. Then last week, looking with alarm at the glut of apples tumbling out of my refrigerator, I decided to do it. I piled some of the thinly sliced apples into a pie shell, layered in an easy salted caramel sauce and topped it with a crunchy streusel. It was a beauty and delicious too. I brought it to a fried chicken dinner some friends threw, along with a tub of salted caramel gelato from Black Dog Gelato (oh man, is that stuff good!) and it was quite the hit. The caramel brings a nice complexity to the pie that sugar alone doesn’t have and the streusel topping adds a nice crunchy counterpoint. I loved it. 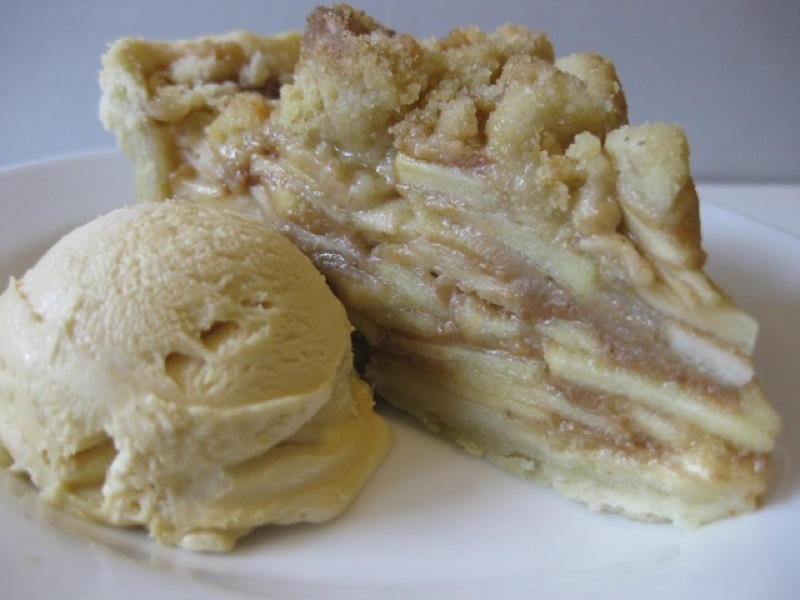 This may just be my new go-to apple pie – I think it will be perfect for your Thanksgiving festivities. I’m planning on making another this week for just that. So while I was making this pie, for whatever reason, I kept singing “Oh My, Salted Caramel Apple Pie” over and over like Usher in full-on auto-tune mode. Could not get it out of my head. And now you won’t either. You’re welcome. – When caramelizing the sugar, a little bit of corn syrup will help prevent crystallization the mortal enemy of caramel. – Use a silver or light colored pan when making the caramel so you can easily see the color of the sugar as it caramelizing. If you don’t have a silver or light colored pan, have a white plate and a spoon nearby. As the sugar caramelizes, drip a little onto the plate to check the color. – During caramelization, it’s important not to stir, rather swirl the pan gently as the outer edges begin to darken. Stirring agitates the sugar and may encourage crystallization. Not a good thing. – Heating up the cream before caramelizing the sugar is helpful because it blends more smoothly – cold cream tends to make the caramelized sugar seize and clumb. – Make sure the pan you’re using is large enough as it will bubble up once you add the cream. It’s better to go to big than too small. A boil over makes one big mess. – David Lebovitz has some good caramel tips here if you’d like to learn more. – The best way to clean the caramel pan is to fill it with water and bring to a boil to dissolve any lingering hardened darkened sugar. 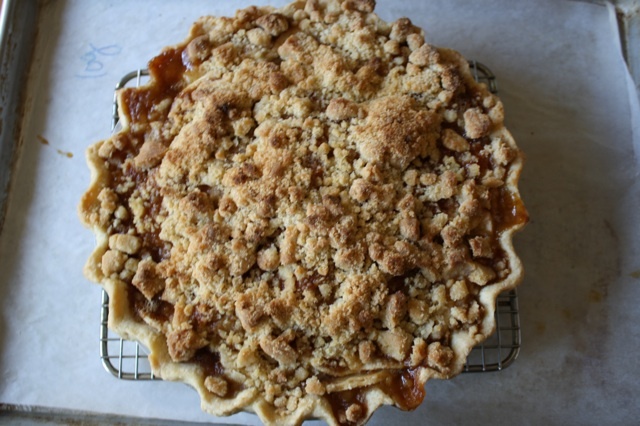 – Always line a sheet pan with a Silpat mat or a sheet of parchment before placing the pie on top. During baking, the pie juices will drip and this makes clean-up a much easier. STRESS BAKING THERAPY FACTOR: REMARKABLE. There’s something about a big golden beautiful pie that makes people smile. Few things are as satisfying to make as a good pie. It’s a big bunch of love in a pie plate, I’m telling you. 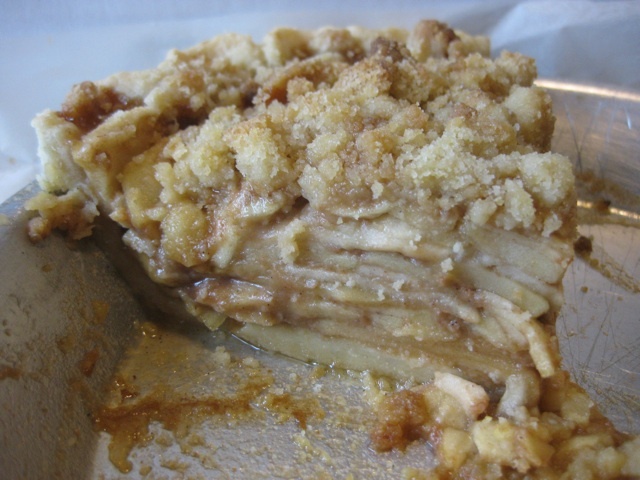 Now here’s the thing: apple pie is good, caramel apple pie is delicious BUT a salted caramel apple pie is miraculous! If you’re going to take the time to make a pie, take a little extra time to make it extra special. It’s more than worth it. For the pie crust: In the work bowl of a food processor, pulse the flour and salt a few times until combined. Add the butter and pulse just a few times to break up the pieces of butter to the size of small peas. Add the ice water to the work bowl and process until just combined. If you have a few dry bits, that’s OK, you can work them in by hand. The key is not to over process; you want to see some visible chunks of butter. Turn out onto the work surface and gently press together to combine and incorporate any dry bits. Pat the dough into a flat disc, wrap in plastic and refrigerate at least 30 minutes. Tightly wrapped, the dough can be refrigerated up to 2 days or frozen up to 2 months. Defrost overnight in the fridge. For the streusel: in a medium bowl, combine the flour, brown sugar, sugar, cornmeal and sea salt. Drizzle the melted butter over the mixture and, with your fingers, toss to fully combine. Squeeze the mixture with your hands to compact and place on a sheet pan. By compacting, you’re creating streusel-y bits rather than a really loose mixture. Set aside until needed. Can be made 1 day ahead. For the caramel: In a small saucepan, heat the cream, butter and vanilla until the butter melts. Turn off the heat and set aside until needed. In a heavy saucepan add the sugar, water and corn syrup. Do not stir, rather, run your finger through the sugar in a cross shape to make sure all the sugar is damp. Over medium-high to high heat, cook the sugar until it turns a medium amber color, swirling the pan as the outside begins to caramelize. Working quickly once the caramel reaches the desired color, turn off the heat and slowly add the warmed cream/butter mixture, taking care as it will spatter violently. Have patience; it will stop eventually. Over low heat, stir until the mixture is fully combined and smooth. Off the heat, stir in the sea salt and immediately transfer to a 2-cup glass measuring cup with a pour spout. For the apples: Peel, core and thinly slice the apples – about 1/8” thick. In a large bowl, gently toss the apples with the lemon juice, sugar, flour, salt, cinnamon and 3-4 gratings of fresh nutmeg. Preheat the oven to 400°F and place a rack in the lowest position. Assemble the pie: Remove the pie crust from the freezer and place on a parchment or Silpat lined sheet pan to catch the inevitable drips. Top with the streusel clumps, sprinkling evenly. Bake: bake 20 minutes, reduce the oven temperature to 350°F, rotate the pie and continue to bake for 30-35 minutes until golden brown and bubbling. If the streusel becomes too dark, cover the top with foil and continue to bake. o… my… god… this was the most delicious apple pie ever! might even replace my grama’s recipe at our house. you did it again, kath – genius. YUM! I am firmly a caramel person too. I try NOT to make caramel at home since I can (and will) eat the whole thing!